All transactions are safe and secure with a reliable history in online purchasing behind each of our associates. 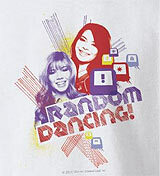 Buy the Random Dancing t-shirt to own iCarly clothing and merchandise. This iCarly Random Dancing t-shirt is quite obviously wonderful for fans who love the random dancing portion of Carly and Sam's show! Are you a robot person, a twister or just someone who flails around everywhere? It doesn't matter which way you dance, that's why it is called random dancing. You can't screw it up. It is just fun. If you like music then you might also enjoy the iCarly soundtrack or Miranda Cosgrove CD to help supply the beat. In addition to the Random Dancing tee above, browse the iCarly Clothing Gallery for more apparel like men's and women's clothes, kids shirts or hoodies.